As I was going to be staying in the five star Swiss spa resort Atlantis By Giardino I thought I would take the opportunity to test out Superdrug’s new Optimum PhytoHydrate products which have been developed alongside Swiss skincare specialists to harness the hydrating properties of birch water. I was invited to review the SPF Day Cream £14.99 and the Micellar Water £4.99 – both exceptionally well priced. Birch water has been used medicinally for many years for its detoxifying and hydrating action. The water is harvested from mature birch trees in spring, when the trees absorb water from the soil. The birch tree filters the water and a small amount of it is tapped and used as a supplement in drinks, or as a therapeutic agent. The message at the spa was loud and clear: hydrate! There were jugs of water everywhere flavoured with fresh fruit and cucumber, plus delicious herbal and detox teas. I have mature skin which has a tendency to dehydrate quickly, so I use a daily face cream with SPF plus a facial oil at night. I used the PhytoHydrate first thing in the morning and topped it up after my spa and relaxation sessions. My skin felt plumped and perfectly hydrated. The SPF of 15 was fine for an autumn break, but come summer I would need a higher SPF of at least 40. The micellar water, I swept across my face after my usual hot cloth cleanser and after removing my make up at night. It has a fresh toning effect and a delicate scent which I liked. I really liked these products and wouldn’t hesitate to use them again. I’ve been using Phenotype City Protection* as my daytime moisturiser for a whole month now, so it’s time for a review. Firstly, it feels like a luxury product in its application. The formula is silky but not heavy or greasy, and absorbs well into the skin. It has a very delicate smell, which personally I prefer to unscented. The ingredients are 97% plant based and the product is cruelty free. Two big ticks in the box for this. It contains an SPF, but doesn’t say what level, so I applied sun protection cream on top when in Spain the last couple of weeks. The product is made in Italy, so I’m not sure if SPF is normally displayed there. The science behind its city protection credentials are that it contains extracts of olive oil, wheat germ and pollen which all have compounds that are antioxidant and hydrolipidic, meaning they should repel and counteract the grime in the city. It’s recommended you use the cream morning and night to get the full effect, but I like to use an oil on my face at bedtime, so I chose to use in the morning only. The product has been formulated for mature or sensitive skin and I have to say my skin has been looking great. *This product was gifted to me in exchange for my honest opinion. I love to try new skin products and just lately I’ve been using this new range from Avene which has been formulated especially for ageing skin*. I have delicate, fair skin with visible sagging around the chops. It’s a family trait and not much I can do about it, but at the same time, keeping my skin in tip top condition means that, at 54, I have very few wrinkles and a good, even skin colour. I do my best with what I’ve got and don’t see ageing as a problem per se. It’s just part of living and railing against it won’t change a thing. Avene aims to challenge the notion that ageing skin is a problem, and urges us to consider it as normal (which if course it is!). The thing we need to take into account, is that as we age, our skin has different needs and we should think about changing the products we use accordingly. My skin is now dryer than it was, but I have increasingly frequent episodes of hot flushing, which make me feel hot and sweaty, but at the same time, are dehydrating my skin even further. The Eau Thermale Physiolift Smoothing, Regenerating Night Balm contains retinaldehyde which boosts the level of vitamin A in the skin. It also contains hyaluronic acid, a water holding molecule which acts as a cushioning agent and space filler in the skin, resulting in a plumping action. To help minimise wrinkles, it contains a compound called ‘ascofilline’ which has been developed by Avene in order to boost collagen production. I’ve also been using Physiolift Eyes which has the same plumping action, minimising under eye bagging. The third product is Avene Thermal Spring Water which is fantastic for keeping in your handbag for when a hot flush strikes! It is naturally filtered water and has a gentle, cooling action. I’ll definitely be packing this in my holiday luggage! So, does it work? Well, my skin feels great and looks good, so apart from the saggy chops (which will never go away) then I’m very happy with it. This photo was taken a couple of weeks ago, so you can judge for yourself. PS I did have a bit of a tan as I’d just been to Tenerife for a week. 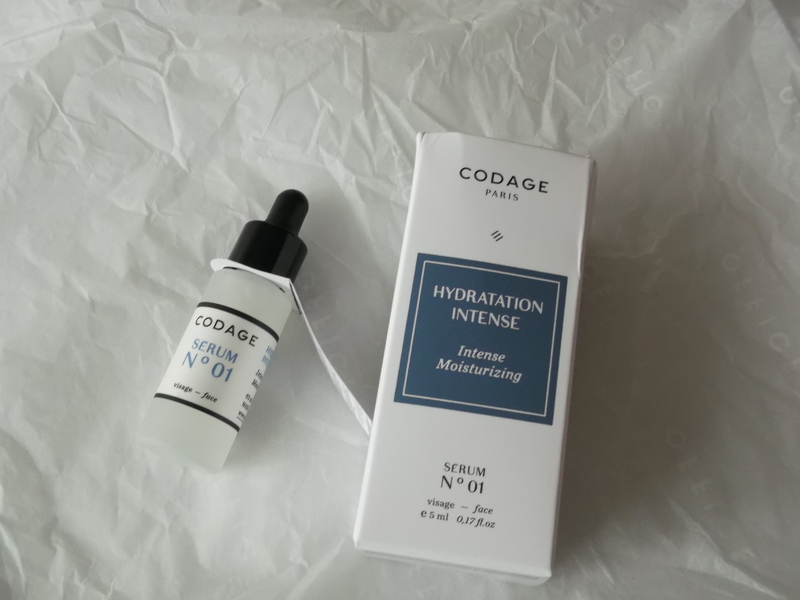 I have mature, dry skin, so I was very pleased to win this serum to review from Look Fantastic. From the Codage website description it sounded perfect for my skin. SERUM N°01 is a powerful formula especially formulated to care for and comfort dry and dehydrated skin. Its extra rich composition provides the skin with intense nourishment, in depth and on the surface, making it softer, suppler and more resilient. Soothing active ingredients and a powerful blend of antioxidants help prevent sensitivity and redness, while strengthening the skin’s natural defences and improving its integrity. Skin is left soft and perfectly moisturized. The first time I used it I thought I could detect a chemical smell, though strangely, I didn’t notice it again. I also initially felt that it was a bit sticky but as I don’t often use a serum I assumed this was the norm. The 5ml bottle lasted me a month and the results, I have to say, have been pretty good. My skin was plumped and glowing and felt very soft to the touch. My problem area is around the neck and to be honest, at 53, I’m not expecting a beauty product to make the slightest difference to the sagging, and this was no exception. Would I use it again? Yes. I liked the results and that’s what matters. If I could change anything, I’d like it to have a fragrance, as one of the things I enjoy about using beautiful products is the feeling of wellbeing you get from the scent. I was craving a rose or neroli aromatherapy hit!